TAMPA, Fla. - March 15, 2019 - PRLog -- HeBronx Bomber Blues a New York City based online media staff were on hand to witness at Steinbrenner Field as the New York Yankees scored 5 runs in the 2nd inning, 5 runs in the 4th, 3 runs in the 5th and 1 run in the 8th lambasting the Boston Red Sox 14 to 1 in MLB Grapefruit League action. The Yankees offense was lead by outfielder Bronx Bomber Aaron Judge who connected for his 5th home run in of the spring in the bottom of the 2nd inning, a 3 run blast which was all the runs the Yankees would need behind a solid pitching performance of Domingo German plus 5 other Yankee pitchers held the Red Sox to just 1 run on 6 hits over 9 innings. The Red Sox could do little against Yankee pitching striking out a combined 10 times. Multiple Yankees had at least 2 hits including Miguel Andujar who continued his hot hitting in Grapefruit league action going 2 for 3 scoring a run with an RBI Andujar is hitting .424 in spring training. Yankees minor league first baseman Chris Gittens went 2 for 2 scored a run plus 1 RBI. Boston Red Sox scored their lone run of the game in the top of the 9th inning. Hector Velazquez started the game for the Red Sox lasting only 1.2 innings giving up 3 hits 4 runs in hist start dropping to 0-1 record. Domingo German recorded the Yankee win evened his spring record to 1-1 while dropping his ERA to a very good 1.54. The Yankees raised their Grapefruit season record to 10-6 good for first place in the Grapefruit League Division while Red Sox dropped to 6 -13 sitting in dead last place in the spring training standings. 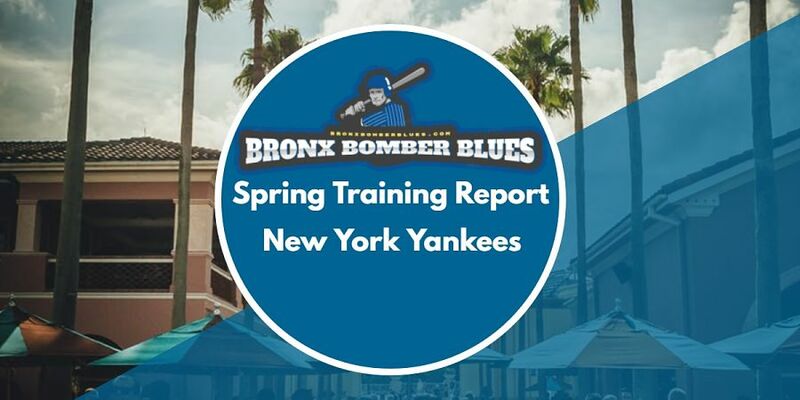 RJ Suitor, Site Manager and public relations for Bronx Bomber Blues comments his staff covering the Yankees in the Grapefruit League action have been very positive about the Yankees play for the most part. In particular Aaron Judge and Miguel Andujar have been hitting the ball really well among a number of other Yankees this spring. Suitor states "If the Yankees can just hold down any more surprising injuries and come out of the spring training ready to play the Yankee fans in New York should be pleased with their regular season results After all these are the Bronx Bombers"
The Yankee will travel to Dunedin FL Saturday March 16th to take on the Toronto Blue Jays. The game is scheduled to start a 1:05 PM est.